1. Your work is very stylised, contemporary and incorporates many mediums, where do you get the inspiration for your pieces? Inspiration can come from many sources. For me, it has always been my family and my experiences that inspire my work. Simple, everyday events can give me ideas. I have a particular affinity for organic forms and I pay a lot of attention to surfaces - contrasts in surface - and to colour. It is important to point out that I work in series, starting with the initial concept and working through it over a period of time. A number of pieces allow me to refine each concept to where it is hopefully working how I'd like it to. 2. If you could invite anyone in the world to an afternoon of turning with you, who would it be and why? My kids. There is nothing better than spending time in the shop with my kids. It is so fun to see the pride they have in their accomplishments when they make something tangible. They have no preconceived notions; they just like to make things. 3. You've combined turning, carving and many more techniques into your work, what techniques are you currently experimenting with? I have a body of work that I have been working on for quite a few years now, in which I have turned and carved a wooden piece. I would like to make that same exact piece in a variety of mediums. Primarily, I am using casting and such materials as bronze, paper, ceramics and carbon fibre. It has been very time-consuming learning to become proficient in many techniques. Definitely a work in progress. 4. What is your current like and dislike? I would have to say I dislike turning dry wood, but I really like turning wet wood. 5. If you could change one thing relating to turning, what would it be and why? That is a tough one. 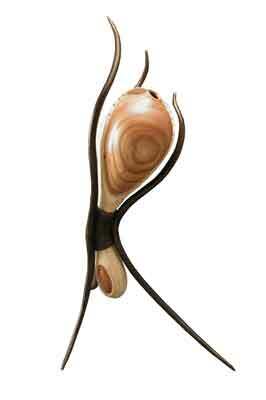 If wood were more flexible that would open up some opportunities for me. 6. With regards what to your career do date, what regrets do you have, if any? No regrets. It has been a fun time! 7. Who are the turners you most admire, and why? There is a long list but at the top of my list would be David Ellsworth. 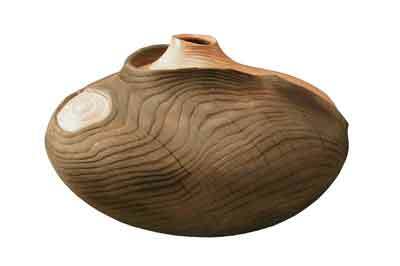 When I first decided to choose woodturning as a career there were very few people I could look to who had done the same - David was one of them. 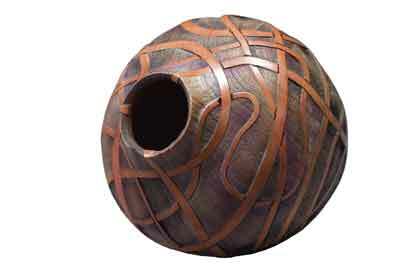 He gave me the confidence to pursue woodturning as a professional. I primarily read technical articles about concepts or materials I am trying to figure out how to figure out. As far as music is concerned, I like a wide variety. 9. You teach, manufacture tools and, of course, turn - what new ventures do you see yourself exploring? I will continue to develop new ideas in my work as well as new tools that make creating the work I want to make possible. I also spend a lot of time figuring out how to have a sustainable lifestyle. The future for turning is wide open. It will continue to evolve and I believe many artistic works will be viewed as fine art. I also think turning will continue to be used as a form of therapy, to take your mind off day-to-day life and give people a productive release. More and more people will discover the joy of woodturning!